The Exclude Grades screen is used in conjuction with the Automatic Exam Import facility and is accessed by clicking on the "Exclude Grades" button from the main School Tab. 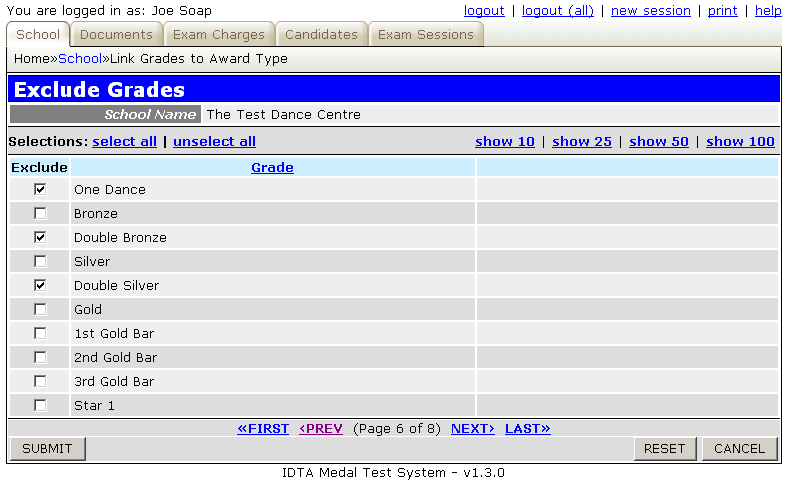 This screen displays all of the grades available within the IDTA syllabus, and allows any of the grades to be Excluded from the Automatic Exam Import to produce the required results for your school examination session. SUBMIT Entries that have been checked or unchecked are saved when the SUBMIT button is pressed. RESET Grades are displayed in grade order by default, but the display order can be changed to alphabetical by clicking the Grade column heading. The RESET button will return to the default sort order. CANCEL Closes the screen WITHOUT saving any changes since the last SUBMIT.